Indigenous Resistance I.R is a global dub collective whose artistic releases happen only through the cooperation and generosity of many people. From those who relay packages of IR cds across to globe to reach indigenous communities or artists donating their work free of charge. 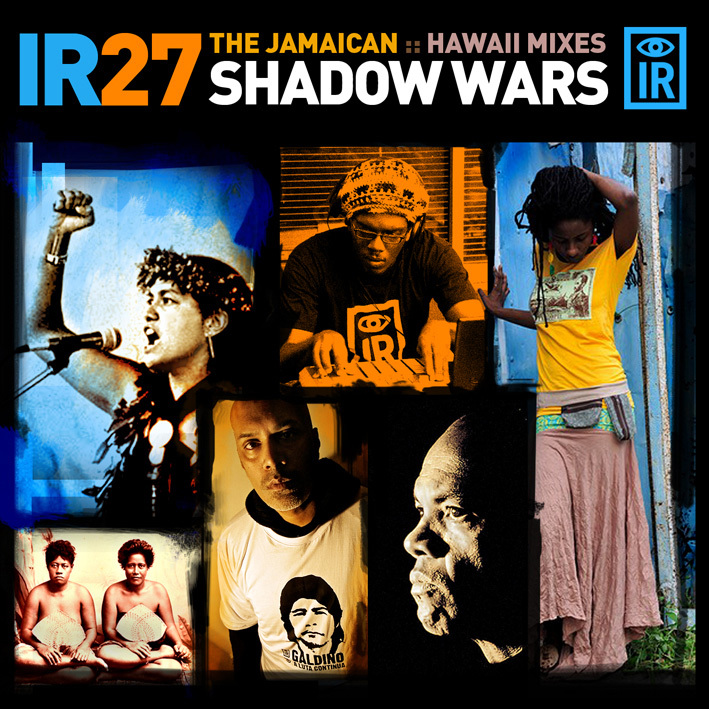 The release IR 27 Shadow Wars:The Jamaican/ Hawaii Mixes ( available here) is an example of artists being generous with their work. This is a release which debunks the media propagated myths of Hawaii as a modern day paradise with dancing happy natives lolling in the sun beside tourists drinking exotic pineapple laden cocktails .The release speaks from the perspective of indigenous people of Hawaii .Jamaican poet and singer Janine ‘jah9 ‘ Cunningham contributes some fiery lyricals that hit out at the colonialism that is still at play in Hawaii where some of the indigenous people feel they have been illegally invaded & occupied by the U.S.A. Musicians like Sawandi, Dr Das, Adrian Sherwood, Skip Mcdonald and D.WattsRiot generously contribute the dub influenced musical textures that mark this release. IR would like to take a moment to really give thanxs to the designers and photograghers that contributed to the artwork that accompany this release. The cover for IR27 is a collage of photos that was created by Brazilian designer Dubdem. Ramjac from the UK took the photo of Dr Das mogelling his IR Galdino t shirt. Ramjac is a longtime IR contributor , a deadly percussionist , dj and top notch sound engineer. Ramjac has done some brillant mixing and mastering for IR and is currently co partner in running WAC recording studio .Fittingly in keeping with the dub tendencies of IR crew this studio has a live room with the an 80 ‘s 8 channel mixer and dub effects called “The Dub Cupboard”. Dr Das’ militant basslines have been a constant presence on IR releases through the years .Dr Das did a remix for the very first IR release 10 years ago ; a blue 12 vinyl with a track in memory of Galdino; the murdered indigenous activist from Brasil .This vinyl release was given to the public free of charge and was freedubbed on the streets of Brazil by Zumbi Musica . The joke within IR is that musicians really started asking for IR t shirts after they spotted Sawandi wearing an IR t shirt at a Dr Das gig in London .IR doesnt sell this t shirt. They are just given as a sign of appreciation to dub folks who contribute to the dub resistance effort. 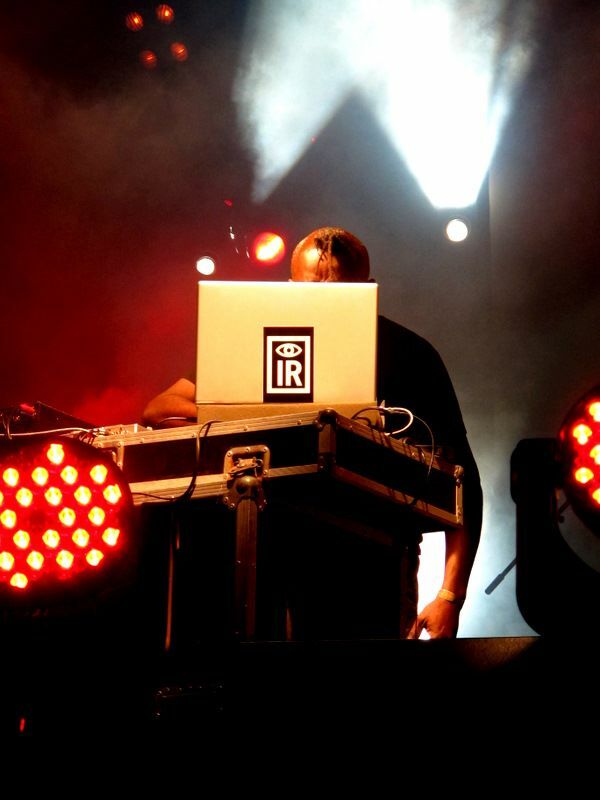 On the album cover you can see a photo of Sawandi spinning wearing his IR t shirt .The photo was taken by Sabriya Simon . 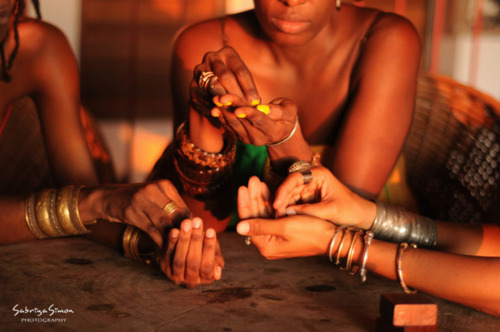 A while back IR was blown away by a photo we saw called ‘The Trinity Gathering ‘, it turned out it was taken by Sabriya an awesome talented photogragher in Jamaica. Check out her Tumblir photo page here The photo of Janine ‘Jah 9’ Cunningham that is part of the IR27 album collage art was taken by Jamaican photogragher Colin Porter who has an excellent book of photography available called ” Finally Exposed” which has been described as ‘a collection of photographs that reflect a non sterotypical view of the Jamaican psyche’. 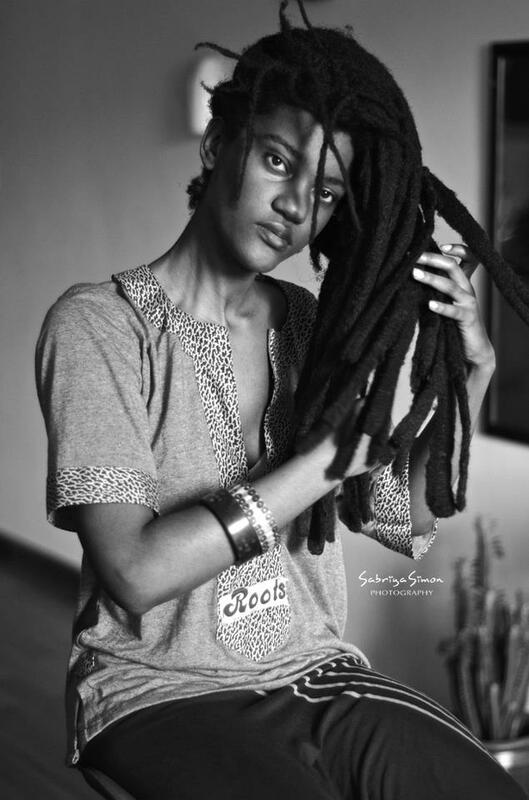 Janine ” Jah 9″ Cunningham wearing clothes designed by Mamayashi and Tuff Like Iron . Photo by Colin Porter. The photo Colin took was for the presentation of some clothing designs created by two dynamic designers Mamayashi & Tuff Like Iron.These two dub sistren are independent artists running their own businesses , they have been very dub in supporting IR so please support them. 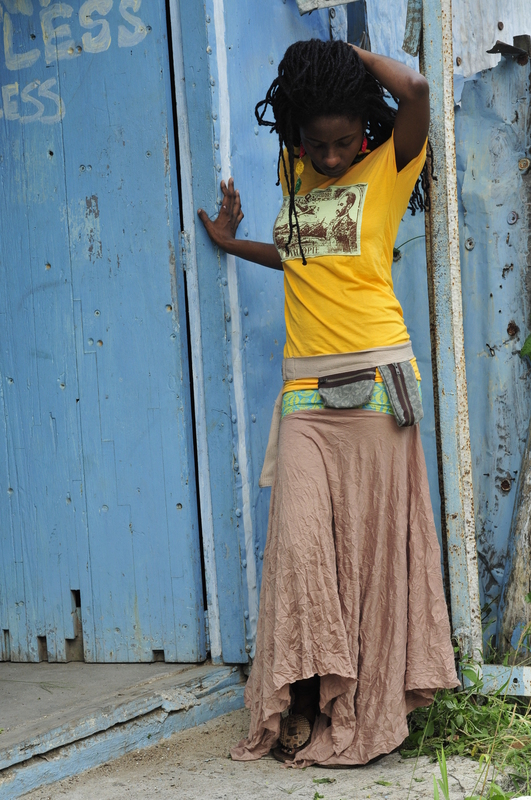 The clothes that ” jah 9 ” is wearing in this photo was designed by them and are available here from their sites . 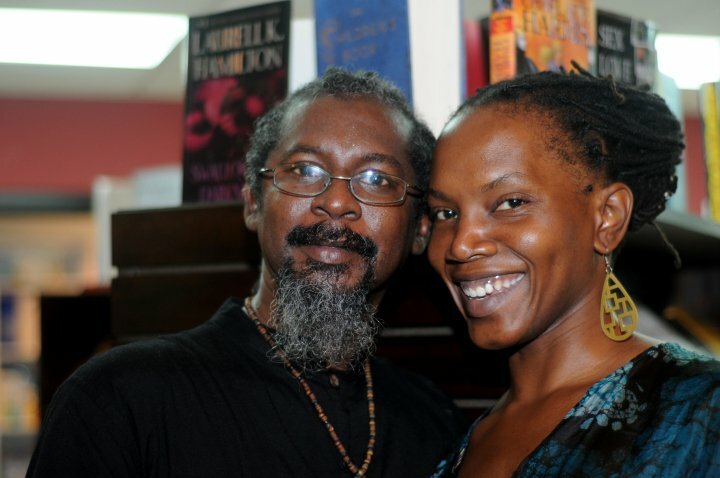 Talented photograghers Colin Porter & Sabriya Simon who have kindly let IR use their photos. photo found on facebook of Colin Porter . Follow the code…IR is about code ..leaving trails of code …. and empowering others to create their own…IR was really heartened by a spontaneous, independent act of resistance..rebel youth in Chia, Colombia went out and made out and made a big piece of grafitti which duplicated the IR logo. you will get a chance to see it in a n upcoming IR video done by a talented film maker Santiago Ospina Castro aka the Dangerous Editor .This is the same IR logo that you can see here on the laptop of D.WattsRiot as he does one of his typically dynamic live dj gigs. To get a sample of what we are talking about check this dub video ”Apocalipsis Privado’ by Jah People feat D.WattsRiot , ‘The Bug’ & Gabba droping heavy beats with yardstyle vibe live! This entry was posted on July 26, 2012 at 10:37 pm and filed under dub releases. You can follow any responses to this entry through the RSS feed.